Having already learned some needlework by age ten, Deborah Wilson's mother and grandmother thought, "it would be ever so adorable were I to needlepoint a Queen Anne footstool to match the piano bench cover executed by my grandmother." She vividly recalls this project: "What followed were six of the most boring weeks filled with dusty rose wool basketweave stitches surrounding a pre-worked center motif. I vowed that although I had previously enjoyed forays into knitting, crocheting and surface embroidery, needlepoint was definitely not for me." It was not until many years later that Deborah would encounter a needlepoint design that would, surprisingly, tempt her. 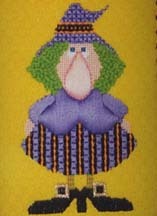 In 1986, while visiting the home of a friend, Deborah glimpsed a Christmas stocking her friend was needlepointing. 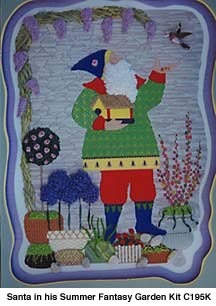 The design was hand painted on canvas, utilizing a wide variety of threads and pattern stitches. Deborah's love of the "glitz and glitter" the design incorporated, lured her in. 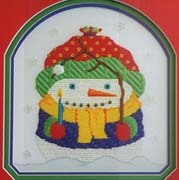 She became so inspired with the previously unrealized potential for creative expression that needlepoint could offer, that she broke her childhood pledge and began to view the technique through new eyes. Close on the heels of this revelation, Deborah was facing impending orthopedic surgery. With the prospect of severely restricted movement because of casts on both legs looming before her, Deborah purchased some hand painted canvases, threads and instruction booklets to help fill her upcoming recuperative period. She recalls: "By the time the casts were removed I was so enjoying the stitching that I was already having difficulty finding designs that suited my needs. After about a year, I took a class in canvas painting so I could design my own." 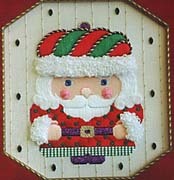 Her first design attempts were creating ornaments for her family's large traditional Christmas tree. Festive holiday decorations were especially appealing to her flights of fancy and she branched out into designs with Easter, Halloween and other holiday themes. She is fond of informing people: "Were it not for bunions, Beau Geste might never have been born!" When queried about her company name, Deborah also enjoys enlightening them of its origin: "Beau Geste, literally translated, means beautiful gesture. As many needlework projects are meant for gift giving or become family heirlooms, they are truly labors of love, which I genuinely feel are among the most beautiful of gestures." Friends saw her own work and began requesting that she paint designs for them. 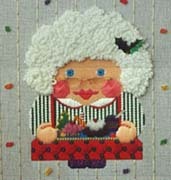 As the demand grew, Deborah joined The National Needlework Association. 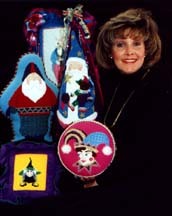 While accompanying her husband on a business trip to the South during the winter of 1989, Deborah presented her designs to the owners of a well-respected needlepoint shop and wound up leaving with a significant order. That same year she exhibited at her first national needlework market. From there the business grew and has been growing ever since. Deborah has taught at shops spanning from Cape Cod to La Jolla, and from Chicago to Houston, meeting with enthusiastic reception wherever her itinerary takes her. She is now active in several national needlework organizations and by regularly exhibiting at trade shows and teaching at shops, guilds and retreats nationally and internationally, is constantly enriching her world with new customers, students, colleagues and friends.
" 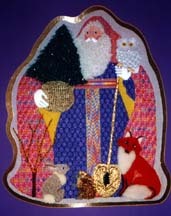 Additionally, Beau Geste is the exclusive needlepoint firm authorized to adapt the world famous Christopher Radko line of limited edition, hand blown glass collectible Christmas ornaments to needlepoint and to sell them as companion sets. Keeping pace with ever-changing trends in the industry is a responsibility Deborah acknowledges and pays heed to. The variety of fibers, fabrics, embellishments and other materials currently available, is a luxury she feels fortunate to have at her disposal. And she relishes each opportunity to familiarize other stitchers with these resources: "Not every needlepoint shop has the ability to stock every thread and, as such, I have been called upon to create complete needlepoint kits which enable shop-owners to introduce their customers to these materials while simultaneously exposing stitchers to threads new to the market." Beau Geste kits are consistently acknowledged to be the finest in the needlepoint industry, containing first-quality hand-painted canvases, superior stitch guides with large, easy-to-read charts, including rare, hand-made attachments, varietal threads, needles and all materials needed to complete an entire project. Certainly, no stitcher can go wrong with Beau Geste! When Deborah was introduced to the Caron Collection, her attention was riveted by the quality of the base threads. She elaborates: "All Caron Collections threads possess what is referred to in the stitching world as a fine "hand." The quality is such that they may be used with confidence as to their lustre, durability and ease in executing a wide variety of stitching techniques. With use, I soon became aware that Lois' overdying treatment of threads could also open a whole new world for me as a stitcher, teacher and stitch planner. Whenever stitching elements of a design such as water, mountains, all forms of greenery, fur, feathers, florals, bargello patterns, woven bands, shaded skies....I could go on forever!...I look to the Caron Collection. Lois has the capacity to both mix subtle colors, which mimic nature, and to combine dramatic colors that inspire new ideas. Because Lois is so sensitive to the evolving needs of today's stitchers, the new colors she continues to introduce are always cutting edge."